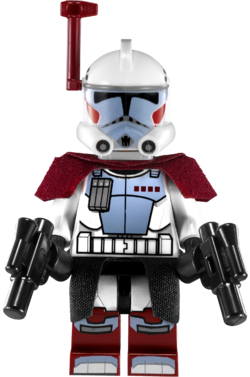 An ARC Trooper is a Star Wars: The Clone Wars minifigure that was released in 2012. The ARC Trooper has dark red legs with white and grey armour printing on the front. Its torso is white, with grey printing representing the front plate of the ARC trooper armour, a white belt outlined in black, a grey magazine in the top right-hand corner, and four red squares on the left. The torso has black hands, and also features printing on the back, detailing a backplate and other aspects of the armour. The ARC Trooper's head piece is flesh-coloured, and has the standard Clone Trooper face design, with brown eyes, black eyebrows and a serious expression. 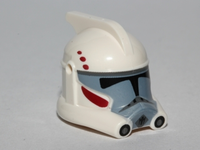 The helmet piece is of a mould currently exclusive to this minifigure, based on an ARC trooper helmet used before Phase II armour was distributed to clone troopers. The helmet features the large crest present on Phase I helmets, and but also has some features found on Phase II helmets, most notably around the bottom of the helmet. It is white, with grey printing around the face area, with flashes of red on the sides. Black is used for detailing the the various parts of the helmet, including the visor, and a red design is also used around the face, and three red dots are present on each side above the visor. The ARC Trooper comes with several accessories, and the minifigure is constructed in a period of seven steps in the instruction booklet. A black cloth kama piece is used and folded around between the legs and the torso pieces, while a piece dark red cloth is folded to form a double-sided pauldron, which goes on the torso's neck. Next, a light grey bracket goes on top of the pauldron before the head piece is put on, and a further three pieces are used for a brick-built backpack, which is constructed and attached to the bracket. Lastly, as the helmet piece can be outfitted with attachments like other clone troopers in The Clone Wars theme, a red rangefinder is attached to the right-hand side of the helmet. The ARC Trooper comes armed with two black blaster pistols. Advanced Recon Commandos, better known as ARC troopers, were clones of Jango Fett that underwent advanced clone trooper training on Kamino. Unlike standard clone troopers, whose genetics were modified to make them less free-thinking and better infantry soldiers, ARC troopers were trained to be independent, and underwent less genetic modification. ARC troopers present during the Battle of Kamino wore prototype Phase II armor. A packet of four red rangefinders and four red visors was released in the set the ARC trooper was released in. The accessories in this colour are currently exclusive to the battle pack. This page was last edited on 6 October 2016, at 22:54.